The 2nd Generation EIS-2B is being replaced by the faster, more powerful, enhanced 3rd Generation iServer "EIT-D". Please see the EIT-D for product details. 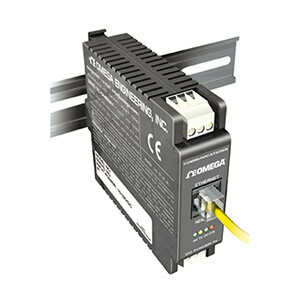 The award-winning OMEGA™ iServer is the simplest, easiest, most economical way to connect serial devices to an Ethernet network and the Internet. When you type its name in a Web Browser, it serves Web pages that let you quickly and easily configure the device for your specific application without any special software. Getting started with the iServer is very simple and easy because it can take a dynamically assigned IP address from a DHCP server on your network. This DHCP client capability is a valuable and unique feature of the OMEGA iServer that makes it extremely easy and simple to start using this device on almost any Ethernet network. You can easily assign a static IP address to the iServer instead of a dynamic one, if necessary. The IP address can be assigned locally through its serial connection, as well as remotely over an Ethernet network via Telnet or a web browser, using its factory default IP address. The iServer can be used to make an existing Serial device a "node" on an Ethernet network with a unique IP address that's accessible from any authorized computer on the LAN, WAN, or Internet. The iServer can instead be used to create a virtual tunnel on an Ethernet/Internet network simulating a local point-to-point serial connection between a serial device and a PC. This replaces dedicated point-to-point wiring limited to 50 feet on an RS-232 connection. The OMEGA iServer packages the Serial data in standard TCP/IP packets that can travel anywhere on the Ethernet LAN or over the Internet. The OMEGA iServer is compatible with almost any device with a Serial interface such as: time clocks, security alarms, card-key access controllers, telecommunications equipment, vending machines, bar code readers, electric power meters, UPS systems, test & measurement instrumentation, PLC's, serial printers, cash registers, and many more. You do not need to rewrite the firmware for your serial devices to work with the iServer, and in some cases might not need to change your application software. Your serial devices will function over the Ethernet network or the Internet as if they were connected directly to a PC. The COM port on the iServer simulates a local COM port on the PC. The OMEGA iServer is compatible with wireless Ethernet. In settings where wires of any kind are not possible, the EIS-2B can be connected to a Wireless Ethernet Access Point enabling simple, economical wireless connectivity of Serial Devices. With the OMEGA iServer: A manufacturing manager can monitor PLC's over the LAN from a desk anywhere in the facility, or from anywhere on the Internet with the proper passwords and authorization. A technician can use a handheld computer with Wireless Ethernet connectivity to change settings on a process controller. The OMEGA iServer model EIS-2B comes complete with full documentation, and firmware. For IT and commercial applications, OMEGA offers other iServer Device Servers in steel enclosures for rack mounting. The EIS-W models feature a DB-9 connector and come complete with an ac power adapter. Flow Control: Hardware (RTS/CTS) and Software (Xon/Xoff).